Following widespread community concern about a “cluster” of suicides, Challenge 2000 is actively helping in Porirua City, north of Wellington. Five youth in Porirua have died of suspected suicide since February, and hundreds of people have turned up to several community meetings, voicing their concerns and looking for solutions that can better support young people. The “cluster suicides” are having a significant impact on the mental health of the rangatahi (younger generation) says Mr Steve O’Connor, Director of Challenge 2000. “We are working with the Colleges, community members and whanau to promote positive engagement, offering services and support systems”, he said. “Our team is committed to ensuring the rangatahi of Porirua can grow and achieve their potential and contribute positively to their community”. Acknowledging the one-off support offered by Government Agency, Oranga Tamariki to provide additional youth programmes, Mr O’Connor said the funding enabled Challenge to initiate and develop a long-term response plan to research the strengths and challenges of the Porirua area. Mr O’Connor says Challenge identified the holidays as times of high risk for youth and he is grateful to the Capital Coast District Health Board for providing two additional workers to assist with assessments and support of those at risk. The holiday programmes were well attended and gave the young people an opportunity to reach out to our team and talk about where they were at and what they needed, he said. He says Challenge’s research will identify existing services and their capacity, any critical gaps and inform our recommendations for the future of Porirua. 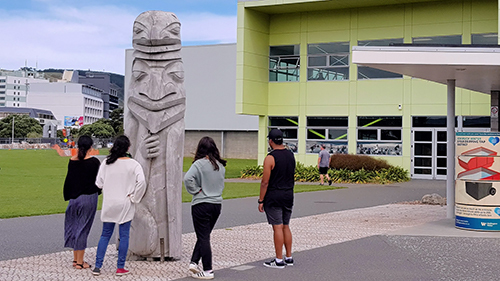 With strong ties to the Porirua community dating back to 1988, Challenge has social workers and youth workers in four Porirua Colleges. The Society of Mary is a partner organisation with Challenge 2000. The Marist Messenger won prizes for best editorial, best article on catechesis and best magazine layout and design at the Australasian Catholic Press Association awards. Awarding the best magazine layout and design, the judges said the Messenger was a highly readable magazine that showed energy and purpose in its design combined with pertinent, authoritative and well presented articles. Describing the winner of the best article on catechesis, the judges said the article provided an opportunity for people to grow in their understanding of a challenging word in the creed without being preachy. They said the article also appealed because it could be used in a wide range of catechetical situations. The Messenger won best editorial for its balanced, constructive and timely consideration of the suicide topic. The awards were announced last night at the Australasian Catholic Press Associations’s Annual Conference in this year held in Wellington. Delegates New Zealand the Pacific and Australia gathered for the occasion.